Wales has always featured in my life, but it's occurred to me that different parts have featured at different times. I recall gatherings and wakes in my uncles' restaurants; lots of fish and chips, followed by Zio Albino's delicious secret recipe homemade ice cream; trips, to Barry Island, Carmarthen or Snowdonia; myriad cousins and marvelling at everyone's lilting, sing-song accents. Then, aged 20, I became friends with someone from the other end of Wales, Holywell in the north. With her I got to know places like Llandudno, Wrexham and Betwys y Coed, Chester just across the border and drove across the Denbigh moors, where I had an experience of exhilaration which I now know to be of God (here). No valleys lilts here, their accent instead reflecting their closeness to Cheshire and the Wirral, which, on a clear day, you could see from my friend's parents' house. 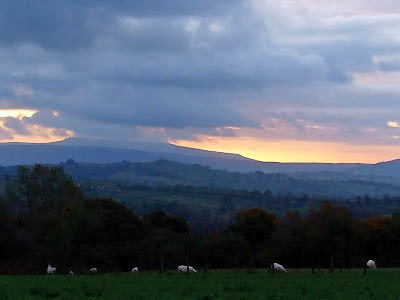 And then, a decade later, I joined the Society, and within a year came on my first visit to Llannerchwen, our retreat centre near Brecon, in mid-Wales; now, very definitely, my favourite place for a retreat. Over the years it has been a place of healing and regeneration, of stillness and quiet discovery, a true home from home in so many ways. And sometimes, when I go to Brecon, I detour to visit my cousins, occasionally driving across a breathtakingly barren moor, to enjoy a cosy meal, family news, a sense of belonging and affection. Little things, which mean a lot. Thus my Welsh connections come full circle: south-north-centre-south. Little things... almost the only thing I know about St David, whose feast is today, is this saying attributed to him, which seems very appropriate for these memories and rambles around his country. Happy feast, to all those connected with Wales! I read all about your retreat place in Wales and wish I had known about it last time I was in England. I, too, have a favorite place for retreat on the west coast run by the Sisters of the Holy Names and have been going out there for twenty years now as it is a sacred place for me.